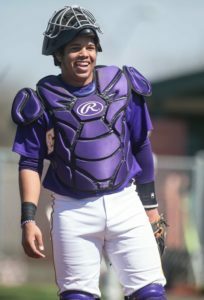 Eagles star catcher Grant Roberts has verbally committed to play at Odessa College next season. After Roberts impressed at an extensive workout, WJCAC Coach of the Year Kurtis Lay offered the Richardson senior a scholarship. He becomes the first player from the Eagles highly touted class of 2018 to commit. He's a strong defensive catcher with huge offensive potential," Lay said. Assistant Coach Logan Parker said, "our already strong recruiting class of 2018 just got a lot stronger." The reigning WJCAC champions had 9 All-Conference players in 2017 and posted an overall record of 46-13. In the classroom, the Wranglers boasted 10 Academic All Americans and were recognized by the NJCAA for their team wide 3.17 GPA. Three graduates are headed to the Big 12 to further their careers, and one to the MLB draft. "I like what they're building," said the Eagles iron man with a smile and a nod. "It just feels right. The baseball, the academics, the environment....it's something you want to be a part of." For his part, Roberts is a major coup for the Wranglers. Years of elite level tournament and travel play have earned the Eagles catcher a national reputation for his leadership, tenacity and cannon arm. His standout summer performances culminated in his inclusion in the Major League Baseball prospect database for the 2018 MLB Draft. Roberts commitment kicks off what looks to be another strong season for Richardson players headed to the collegiate ranks. Eagles coach Mike Tovar will be looking to expand on the program's 2017 success, where 3 of 5 graduating seniors committed to play college baseball. The Richardson Eagles extended their winning streak to 6 games on Friday night as they ground out a 2-1 result over Berkner to move 2 games ahead of WT White in the District 9-6A playoff race. Late runs by James Monroe and Darrien Blalock proved enough as the Eagles came from behind late in the game. Junior Will Duncan returned to the mound with a strong performance. The big right-hander allowed only 3 hits in five innings and struck out 6. Junior Dan Wood came on to close out the game with another incredibly efficient outing, striking out 4 of the last 6 hitters. Will Duncan on the mound against Berkner. Photo by Michael Mulvey. Berkner got off to a hot start with two first inning base hits. Cole Hill led off with a dribbler single just into the right field grass. A Garret Randall single to center advanced him to third on the hit and run. On the next play, a throwing error allowed Hill to score, giving the Rams the lead. Dan Wood throws to first base. Photo by Michael Mulvey. Richardson kept the bats going. Will Duncan doubled in the second, Esteban Cardoza and Grant Dodgen both singled in the third, and Grant Roberts singled in the fourth. But the Eagles remained frustrated on the basepaths and could not score. Cardoza was stranded, Dodgen forced out on a fielder’s choice when a bunt went wrong, Monroe was caught stealing and Mark Mercer was thrown out at the plate. Grant Dodgen is forced out at second on a fielder's choice. Photo by Michael Mulvey. The breakthrough finally came in the 5th inning, when Monroe doubled, advanced on a passed ball, and then scored on the delayed steal. An inning later, a towering sacrifice fly from Caleb Combs drove in the Darrien Blalock for the winning run. James Monroe steals home for the tying run. Photo by Michael Mulvey. Darrien Blalock scored the game winner. Photo by Michael Mulvey. The Eagles extended several streaks that have powered them to playoff contention. They’ve won 6 in a row. Richardson pitchers have gone 5 games without yielding an earned run. Senior Esteban Cardoza-Oquendo extended his hitting streak to 8 games, while Senior Grant Dodgen extended his to 7 games. Esteban Cardoza-Oquendo is riding an 8 game hitting streak. Photo by Michael Mulvey. Richardson closes out their regular season next week against district leaders Coppell. The series promises to be hotly contested, as Coppell needs to win both games to clinch the District championship while RHS needs to win one to guarantee a playoff spot. Tuesday night at RHS is senior night, where the Eagles will honor graduating seniors Esteban Cardoza-Oquendo, Caleb Combs, Grant Dodgen, Ryan Harding and Alejandro Mejia. Seniors Grant Dodgen (14) and Esteban Cardoza-Oquendo in their pre-game ritual. Tuesday night is senior night and their last regular season home game. Photo by Michael Mulvey. Richardson Senior Caleb Combs continued his stellar season with a one-hit shutout on Wednesday night as the Eagles inched closer to the playoffs with an 11-0 hammering of Berkner in the Rams’ own backyard. The game was billed as “the Tovar Tussle”, pitting brothers Mike and J.P. Tovar coaching against each other. It showed the promise of an edgy encounter, with the Eagles clawing for the final District 9-6A playoff spot and Berkner relishing the opportunity to play the spoiler and get the upper hand on personal rivalries. It didn’t work out that way. All photos courtesy of Michael Mulvey and Michael Mulvey Studios. Combs dominated yet another district opponent. He threw 14 strikeouts, only 3 walks, and 63% of his pitches for strikes. Berkner hitters did not manage to get single ball out of the infield until the last inning. The right hander’s district performance on the mound has become the stuff of which memories are made. He has allowed only one earned run and 9 hits over 26.4 innings pitching against district opponents. He has struck out 51 opponents on his way to a 4-0 record. It is not difficult to understand how Richardson’s resurgence from last place to playoff contention has corresponded to his recovery from injury and return to full fitness. Junior James Monroe steals another base against Berkner. The other story of the Eagles’ rise has been consistent production at the plate, which continued against the Rams. 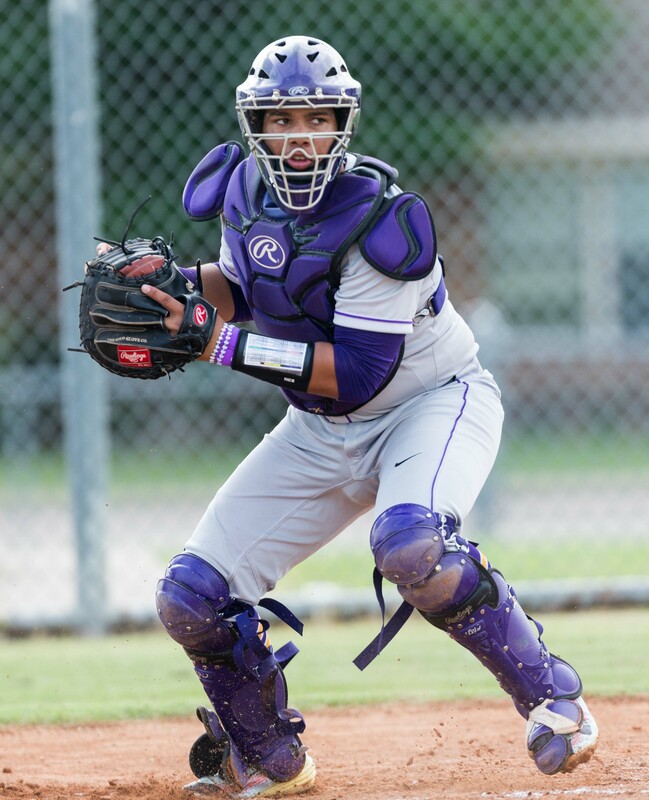 Berkner were buried under and avalanche of hitting and speed as Richardson bats lit up the night air, led by Combs, James Monroe and Caden Kirk. Kirk was especially outstanding, going 3-3 with 4 RBIs. Monroe went 2-4, had an RBI himself and stole 2 bases. Caden Kirk hammers home two of his 4 RBIs against Berkner. By the end of the night, 9 of 10 Eagles that went to the plate came away with base hits. Three doubles, three stolen bases, and three Berkner errors added to the rout. Senior Grant Dodgen beats out another base hit. Berkner’s only highights were a 4 strikeout performance from reliever Jack Rouse and a last gasp no-hitter spoiling double in the bottom half of the 7th inning. The Rams travel to The Nest on Friday night in search of redemption and relief from a losing streak that now measures 4 games. Dan Wood’s 2 hit shutout helped the Richardson Eagles complete a series sweep of Skyline at The Nest last night. Senior DH Ryan Harding went 2-3 and SS Esteban Cardoza-Oquendo added 2 RBIs en route to a 5-0 victory. But the night belonged to Wood, who threw the Eagles first complete game of the season and needed only 101 pitches along the way. Wood struck out 5, walked only 2, and threw over 61% of his pitches for strikes. He averaged fewer than 4 pitches per batter and Skyline hitters managed a meager .083 batting average against him. The performance was as clinical as it was efficient, as he tore through the Raider batting order. The rest of the Eagles responded, providing run support and strong defense. Cardoza-Oquendo led the way, reminding all in attendance that last year’s district Defensive Player of the Year honors were well earned. Catcher Grant Roberts added yet another segment to his highlight reel with a 6th inning gun-down of Skyline catcher Espinoza. As Espinoza broke for second base, the pitch dropped into the dirt, rebounded up off of Roberts chest and squirted up the 3rd base line. Roberts shot out from behind the plate, grabbed the ball, and whirled 270 degrees to make a perfect throw arriving just ahead of the runner. The bats rang all through the Richardson order, with base hits coming from, James Monroe, Grant Roberts, Caleb Combs, Harding, Cardoza-Oquendo, Mark Mercer and Grant Dodgen. Cardoza-Oquendo extended his current hitting streak to 6 games, while Dodgen’s stands at 5 and Mercer’s is at 4. The trio have enjoyed a strong April, with Cardoza-Oquendo hitting .428, Mercer hitting .416 and Dodgen hitting .461 during the Eagles 4 game unbeaten run. The win pulls Richardson level with W.T. White for the final playoff spot in District 9-6A. The Eagles face Berkner next week in a pair of must-win games. The Richardson Eagles dominated the Skyline Raiders 10-1 Wednesday night with a lethal combination of pitching, hitting and speed. Senior Caleb Combs got the win on the mound, yielding just one unearned run and two hits. It was Combs third dominating performance in as many outings, as the Northern Oklahoma commit continues to fuel the Eagles drive for the playoffs. The story of the night was the continued resurgence of the Richardson bats and their ruthless and clinical application of speed on the basepaths. Junior Mark Mercer got things off to a good start in the first inning with a base hit, a stolen base and a run scored flying in from third beat the throw on a passed ball. The second inning featured more speed, as Senior Grant Dodgen beat out a drag bunt for a base hit, moved to 2nd on a well-executed sacrifice bunt from James Monroe, and scored from second on a Mark Mercer single to center. Some shaky defending in the bottom of the third allowed Skyline to claw back a run, and the game stayed close for a while. But the Eagles answered with a 3 run 4th inning, scoring Caden Kirk, Dodgen, and Monroe. The fifth inning belonged to junior catcher Grant Roberts, who drove home freshman Luke Mulvey (courtesy running for Combs), and then ended Skyline's threat by gunning down their star shortstop with a snap throw to first base. The sixth inning put the contest finally and completely out of reach. Dodgen led off with a single to right center, stole second, and then advanced to third on the overthrow. Monroe and then Mercer were hit by pitches in quick succession, loading the bases for senior TCU commit Esteban Cardoza-Oquendo. His response was a towering triple off the right field wall, driving in three runs and missing a grand slam by just a few feet. Senior Ryan Harding stepped up and drove in Cardoza-Oquendo with a single to left. The win brings the Eagles within a game of WT White in the District 9-6A playoff race. Richardson hosts Skyline for the home leg of the series tonight at The Nest. JV starts at 5pm, followed by Varsity at 7:30.